Spectators and sponsors want to see many goal. Although new rules should allow more goals, the Average number of Goals per Game has continued to decrease. Why? Performance has the answer: far too many shots are too easy. Before this year's season it was stated that the judgments should be rigorous in assessing games destructive elements, such as slashing and hooking. The idea was that it should lead to faster games and thus more goals. But the result is so-so. The Average has increased somewhat, but it is hardly talk of an explosion of goals. The changes last season did not have the intended effect, the Average number of Goals per Game continues to decrease, now to a record low 4.79 goals per game. Why have the efforts failed? First of all, because no one has known the real reason. Secondly, it requires detailed studies of a large number of matches to find the answer. That knowledge is now available by the Performance studies. Supported by the former goalkeeper Stefan Lunner’s statistics from 1000 games in the NHL, KHL, and SHL (Swedish Hockey League), we have found the answer: the analysis showed that too many shots that are easy for the goalkeeper to save. The graphs on the right show what it's all about. 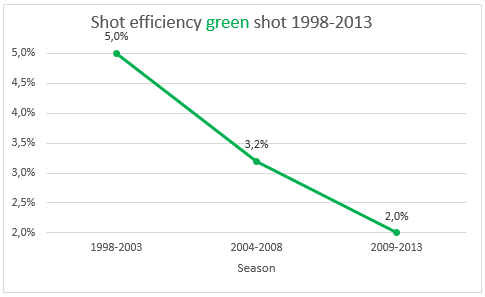 The proportion of easy - green - shoots have grown since the Performance statistical analyzes began in the late 1990s. Moreover goalies of today saves save many more green shots than 15 years ago. The goalkeepers have become better at what is possible to improve. 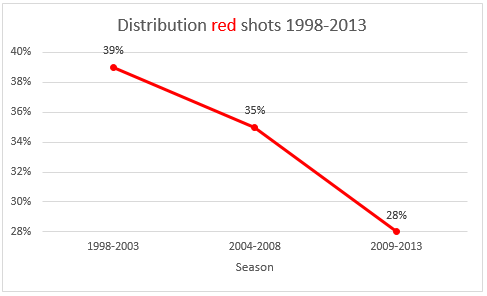 But difficult shots – red shots - are even harder to save today than 15 years ago. 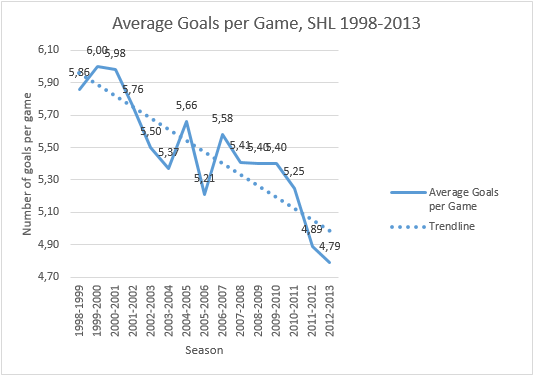 As shown in the graphs, the Average number of Goals per Game was above six during the 1999-2000 season, while during the last season the average dropped below five goals. 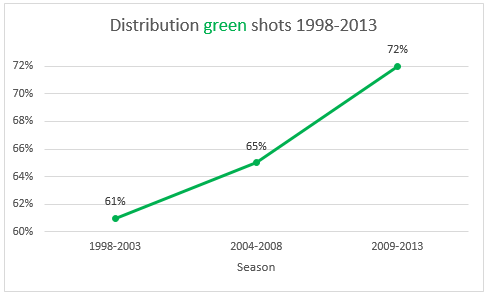 During the same period, the proportion of green shots increased from 61 percent 2000 to 72 percent last season. The same applies to red shots. They were more frequent - nearly 40 percent of the shots on goal - during the seasons 1998-2003. Today the red shots are only 28 percent of the shots in a game. The fact box to the right indicates why green shots are easier for the goalkeeper. When the goalkeeper can focus his gaze on the puck for more than 0.5 seconds, the chance to save is dramatically increased - the green shot - since the goalie can prepare the movement to save. However, if the goalkeeper unsighted or forced to make rapid lateral movements, the gaze time becomes too low, and the chance to save is dramatically reduced – the red shot. A team that wants to win should therefore focus on difficult – red shots- only, and force the opponents to take the simple - green shots. Fifteen years ago, five percent of the green shots resulted in a score, but today the goalies are better and only two percent of the green shots scores. 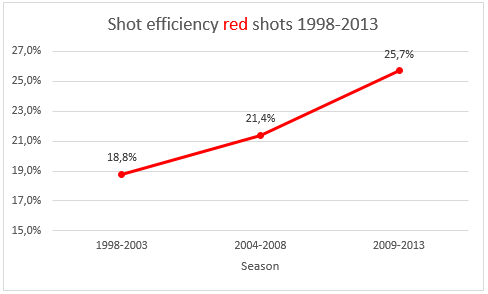 The red shots have become fewer under the same period, yet they are much more effective. Nowadays a quarter of the red shoots results in a score. A good goalie is lucky, they say. Surely luck can help, but there is not so much luck that one can change the facts. More difficult shots - red shots – will give today’s forwards the chance to become scoring champions. Statistics are based on studies of over 1,000 matches in NHL, KHL and SHL. What determines whether a shot is green or red depends on what happens during the last half second *) before the shot is taken. Which shot is green or red? Clear line of sight to the puck for at least 0.5 seconds before the shot is taken. Body and head need not rotate and / or move sideways for at least 0.5 seconds before the shot is taken. All shots that violates the green shot criteria is a red shot. Thus, either if the goalies line of sight to the puck is broken during the last 0.5 second, or that the goalie is forced to move during the last 0.5 second before the shot is taken. A combination of these factors is also a red shot. * ) A half second gaze focused on the puck is required for the brain to translate the visual impact to make a save. This is shown by the Canadian researcher Joan Vickers as well as by Performance’s own research.